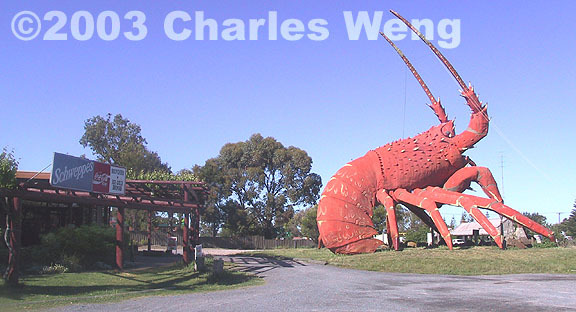 The Big Lobster -- In Australia, a lobster is known as a "cray" or "crayfish." Thus the moniker evidently had the effect of drawing foreign tourists to this most conspicuous landmark, not that it needed any help -- until now. I was sad to see the sign "for sale" on the premises. A sneak peak in its '70s interiors showed that the last lunch special served was still scribbled on the blackboard. Kingston SE is the gateway to the Coorong, a 50km stretch of salty lagoon sheltered from the sea by a long sand bar. Great seafood is found here, to the delight of humans and seabirds -- particularly pelicans -- alike.